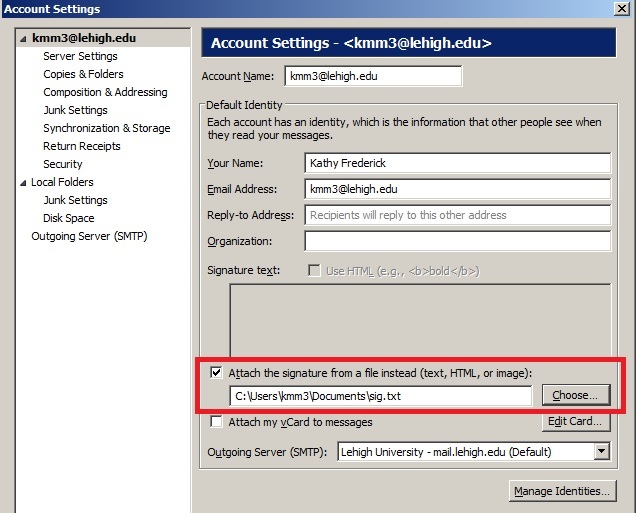 Follow these instructions to create a text signature file to use in Thunderbird. Open Notepad (or another text editing program) on your computer and type your signature as you would like it to appear. URLs entered as text will appear as hyperlinks to email recipients. Save the file to your hard drive as a text file. Open Thunderbird and click Tools > Account Settings. Check the box Attach the signature from a file instead (text, HTML, or image). Click Choose and select the file you created in Step 1.